One of the best ways to find good eateries is through word of mouth as nothing can beat that person-to-person recommendation. 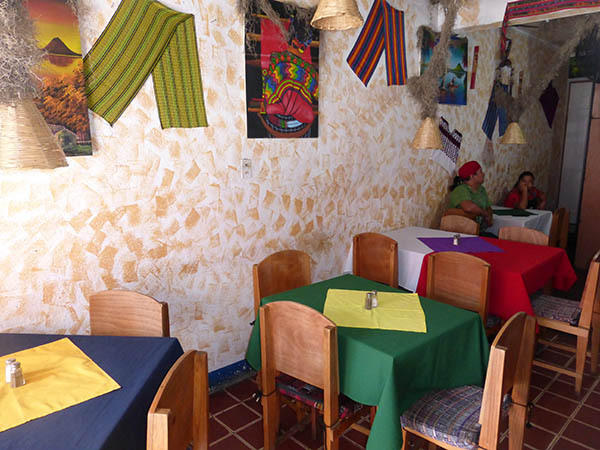 In previous years that we have lived in Panajachel, we never paid mind to this little restaurant. It was on a section of street that wasn't on our daily trek, so without knowing it, we were missing out on one of the best places in town to get a meal! 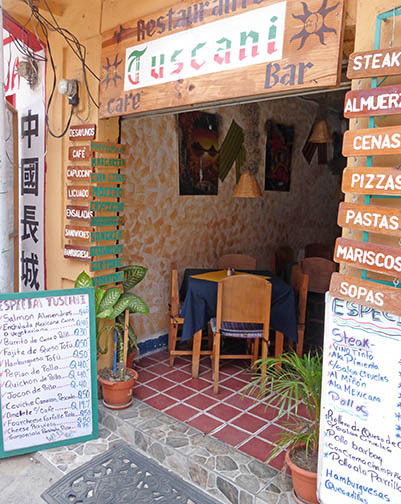 Basically a tiny hole-in-the-wall, Tuscani has 6 tables. It serves breakfast, lunch and dinner, has steaks, chicken, pizza, seafood, pastas, salads and daily specials. Beer, wine, selected liquors and specialty coffees are also offered. Here you see Chef Walter with his head wrapped in a red cloth. Walter does a fine job in cooking meals and he presents the dish beautifully. 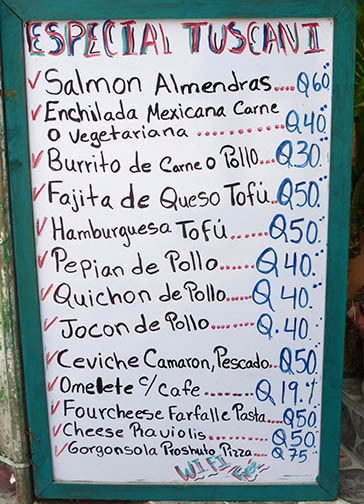 Walter also speaks English, and the menu is in English or Spanish. 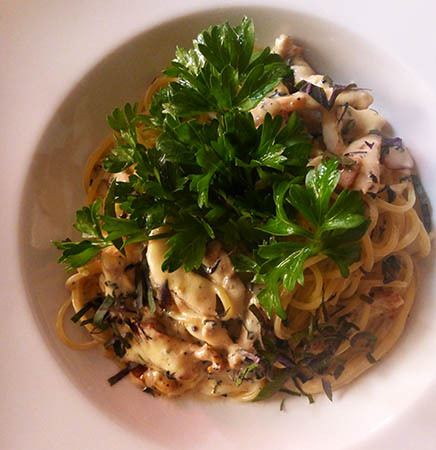 This is an incredibly delicious chicken breast cooked to perfection in a cream, bacon and mushroom sauce. The chicken rests on a bed of freshly mashed potatoes and there are grilled vegetables, bread and butter with the meal. The portions are just right and the flavor goes a very long way. This amazing pasta dish with tender chicken was priced at $5USD. Again, plenty of food, and the flavor was mouthwatering, not bland as some pasta dishes can be. Fresh Italian parsley is the garnish in the middle. 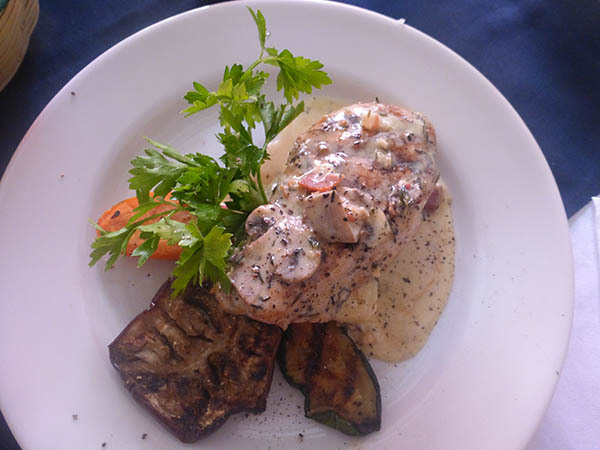 One of the specials listed on the board is a chicken breast stuffed with goat cheese in a prune sauce. This was amazing and surprisingly avant-guarde. We have seen their salads being ordered by other patrons and they are fresh and alive. Tuscani's is also known for their delicious individual pizzas, one of them listed here is their Salmon Pizza. All of their ingredients seem to be of high quality and packed with flavor. 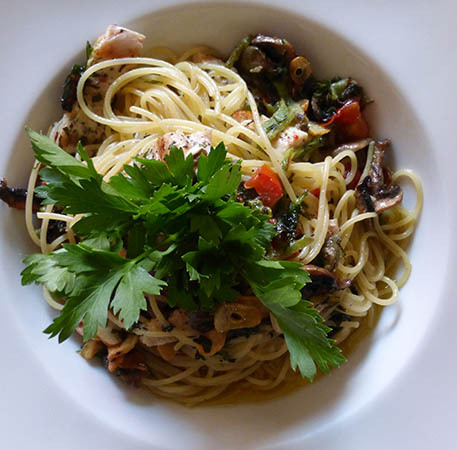 This pasta was power-packed with flavor: capers, mushrooms, tomatoes, olive oil, lemon, garlic and chicken. It truly was delicious to the last bite. Nothing boring about this dish and as with most of their menu items, comes highly recommended! The salmon with almonds was a real treat and the price is $8USD. Flakey, moist, and of course, flavorful. 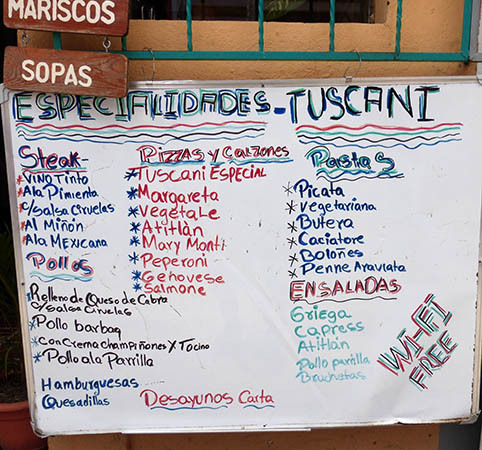 An individual pizza with Gorgonzola cheese and prosciutto ham is also listed for $10USD, fish and shrimp ceviche runs $7USD and fajitas with cheese and tofu us $7USD as well. There is no shortage of choices in this affordable, dynamo-of-a-restaurant. Located on lower Santander, open daily except Tuesdays. Stop in sometime, you won't be disappointed!